Helen F. was born in Romania, as Helen Safa. She remembers the Hungarian occupation and growth of antisemitism very clearly. 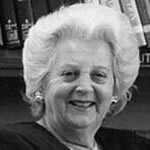 Helen’s family was forced with all the other Jewish families in their community to move to a local ghetto, where they stayed for three to five weeks. They were then deported to Auschwitz. Helen endured a months-long death march until she and her sister made a daring escape. After liberation, Helen made her way to Romania by walking and by hopping freight trains. When she arrived home, she was reunited with and married her pre-war fiancé and together they left Romania shortly after it came under communist rule. 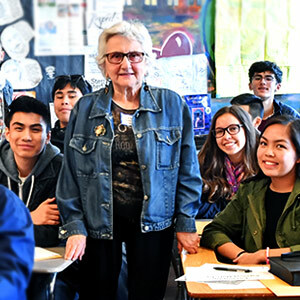 Helen now lives in the San Francisco Bay Area and spends her time traveling to various schools and civic groups educating the public about the gruesome realities of the Holocaust. Helen describes the daily challenges of living in a concentration camp and the effects it had on the people living in those conditions. You know, you become like an animal; although, I can´t say that we would harm each other. We were always, the good will to help each other was always there. But you, somehow you get to be different than you are in real life, you know, because everybody´s fending for themselves. Everybody wants to survive. But I cannot remember one incidence that somebody would have harmed the other, or would have stolen the bread from those who saved it. Yeah, Sometimes it happened that we were sleeping outside, and there are all kinds of people. No matter how small and there are all kinds of people. No matter how small that little piece of bread. Some of us would say, “Oh, I must have a bite of bread in the morning. I’ve got to save these two bites of bread for tomorrow morning, because if I am able to put two bites of bread into my stomach, then I can start the day.” And they would save it and then they would sleep. And then they would fall asleep forever.